Ever since we crossed back into the US we could all sense that our trip was winding down. Vermont, New Hampshire, and Maine are all familiar territory, and I think we had the sense that if we weren’t careful we’d end up re-tracing roads we’d all driven before, and becoming bored with the final days of our trip. Yet we were still in the midst of some beautiful country. So despite having Gaspé behind us, we decided to maintain our relatively slow pace and try to find things to do in the upper part of Maine and New Hampshire that we had never done before. We selected a convoluted path following Route 16 past small towns and summer cabins. This turned out to be ideal. While entirely paved, it had the benefit of lots of vistas, sweeping turns, interesting small towns, and not much traffic. The weather was once again ideal for riding, so we settled in at about 45-50 MPH most of the way and just soaked up the scenery. Early in the ride we stopped in Abbott, ME for a quick break. Lately my shoulder has been bothering me more when we ride. The arm extended position really starts to hurt after a while, so an hour is about all I can go without giving it a rest. But this was really a great excuse to stop in at the Abbott Village Bakery where, as luck would have it, the donuts are truly awesome. I got one for the road after eating an enormous I-forgot-what-they-called-it jelly and cream stuffed creation. I may have forgotten the name but it will take me a long time to forget that donut. I’d go back but it’s almost 300 miles from our base camp in Vermont, and 2,900 miles from our base in Arizona. Some great things are destined to stay local, and that’s a good reason to keep traveling. Just down the road we found an ATV shop, too. Steve had been struggling with chain lube ever since the trip started. It wasn’t holding up, and he was re-lubricating and adjusting the chains nearly daily on both our bikes. The solution, he decided, was chain wax, and Victory Motorsports in Maine had one can of the stuff left on their shelves. We did a quick spray wax on all three bikes and it seemed to last a lot longer. I was feeling so relaxed that I took very few pictures on this leg of the trip, and I even stopped writing nightly notes on our travels. Sometimes you just have to experience the travel and not worry about documenting it. Traveling by motorcycle was becoming as natural as Airstreaming, now that I had the routine down. As we paralleled the Kennebec River in Maine I remembered long-ago whitewater rafting trips done on that same stretch of water. It was all becoming very familiar and easy, even though I hadn’t seen most of the roads before and we didn’t yet have a firm destination for our stop that night. 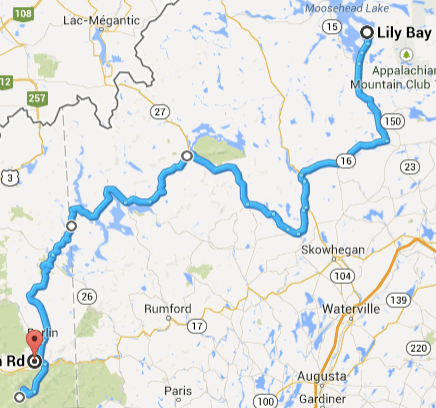 Our working plan was to ride to Gorham, NH, and check out Mount Washington. If you aren’t familiar with it, it is famous as the location of the “world’s worst weather” and there is a road all the way to the summit which (yet another lucky break) would be open only to motorcycles on this particular day. We figured it was a sign that we were destined to end our day with an epic ride to the 6,000+ ft peak of Mt Washington. It was still early enough to drive up the 8-mile road to the top, have a good look, and start heading back by the mandatory 6:45 departure. It was a very nice day by Mt Washington standards: mostly clear skies, temperatures in the 60s, winds running about 55 MPH. Pretty bad. Unlike virtually everyone else, we were on tall, light, high-clearance bikes designed to maneuver around rocks and through potholes. Where we had the advantage on tricky dirt trails, these guys had the advantage on pavement and most importantly, in wind. I promise not to exaggerate. This was without a doubt the most terrifying experience I have ever had while operating a motorized vehicle. The time that the trailer brakes on the Airstream went out while descending off a bridge to a stoplight in the rain was a relaxing nap compared to our ride up Mt Washington. After we reached about 5,000 feet of elevation and were above the treeline, the road becomes entirely exposed to the brutal winds that never stop up there. The gusts that hit us broadside were (we later discovered) reaching 65 MPH, which is still a nice day by Mt Washington standards but nearly impossible conditions for a BMW F650. It was all we could do just to hang on to the handlebars with a death grip and try to stay upright against the unpredictable gusts. My bike was being slapped around the road like a hockey puck. Sometimes I had to lean sharply in the opposite direction of a turn just to counter the huge impact of the wind. I felt like a Weeble, except that there was the very real possibility that at any point I would fall down or even be blown right off the road and down hundreds of feet down a rocky slope—because of course there are no guardrails on this road. We got to the top somehow. The wind was so strong in the parking lot that Steve had to relocate his bike into the lee of a large cliff, otherwise the wind was simply going to blow it over. We finally had a chance to take off our helmets and talk, and discovered we’d all had the same experience and thoughts on the way up: holy wind gusts, Batman! A ride like that will teach you to focus very sharply on the task at hand. And I was already thinking of something horrible: we had to go back down the road later. Perhaps there was an Inn we could stay in, for a month or two until there was a small break in the wind? Maybe we could call a flatbed to haul the bikes back? The picture above makes it look so pleasant, but you can’t see any indication of the wind that was howling at every moment. I recommend Mt Washington in a car, or at least in a much heavier bike on the calmest possible day. Then you can really enjoy the view, the museum, the coffee shop, and the outdoor observation deck without having terror in your heart. After about half an hour to calm down, we came up with a strategy. Upward travel would be stopped at 6:00 pm, so we’d wait until about 6:10 to start heading down. That way we’d likely be the only people on the road and could have the freedom of being blown across two lanes instead of just one. That sounds ridiculous but it helped quite a lot. Downhill turned out to be not quite as bad—we got a small break from the wind during the most exposed portion of the road—and when I counted bikes at the bottom there were still three of us. A bit shaken, perhaps, but intact. So be careful what you wish for. We wanted something exciting and new to do on this last leg of the trip, and we got it. Tonight’s stay is the peaceful Moose Brook State Park in Gorham NH. No bugs here, for some reason, so we got to stay DEET-free. It’s a short ride to the center of town from the state park, and we found an excellent wood-fired pizza place in town (with a power outlet under the booth for me to charge up my helmet intercom and cell phone). This night of camping will be our last on this trip. Tomorrow, we have only a half-day ride back to home.